Reading Comprehension - Mardi Gras Celebration! 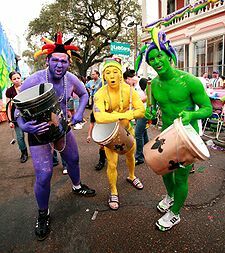 Louisiana hosts one of the most well known celebrations - Mardi Gras. Mardi Gras is French for "Fat Tuesday". This holiday is sometimes called "Shrove Tuesday". People wear masks and costumes, overturn social conventions, dance, organize competitions and parades. Related popular practices were associated with celebrations before the fasting and religious obligations associated with the penitential season of Lent. Today Mardi Gras is celebrated in many parts of the world - Brazil, Belgium, Italy, Panama. The American town which holds the biggest celebration is New Orleans, Louisiana. It was the French explorers who started this celebration on the Mississippi River in the late 17th century. Parades are divided into organizations called "Krewe". These Krewes are responsible for all aspects of their parades. The parades go in the streets ruled by the "King and Queen." Beads, "doubloons" and cups are thrown to the throngs of spectators by the riders as souvenirs of Mardi Gras. What does Mardi Gras mean? What are thrown from Mardi Gras floats in parades?